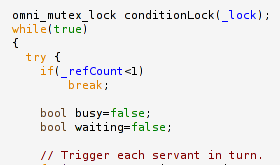 The code triggers each of a set of ProxyPushSupplier objects in turn. Each supplier pulls messages from a central queue and sends them to a remote PushConsumer object. When triggered, suppliers set the 'busy' flag if they actually do something, they set the 'waiting' flag if they are expecting a response from their consumer, or they set neither flag if they are idle. The run() method uses the values of these flags to judge how often the supplier objects should be triggered. Notice the use of class PauseThenWake which pauses the thread upon construction and signals it to wake up on destruction. This example uses omniORB's omnithread class - a thin wrapper around POSIX threads. omnithread is a portability wrapper that makes it easy to port thread code across a wide variety of architectures.